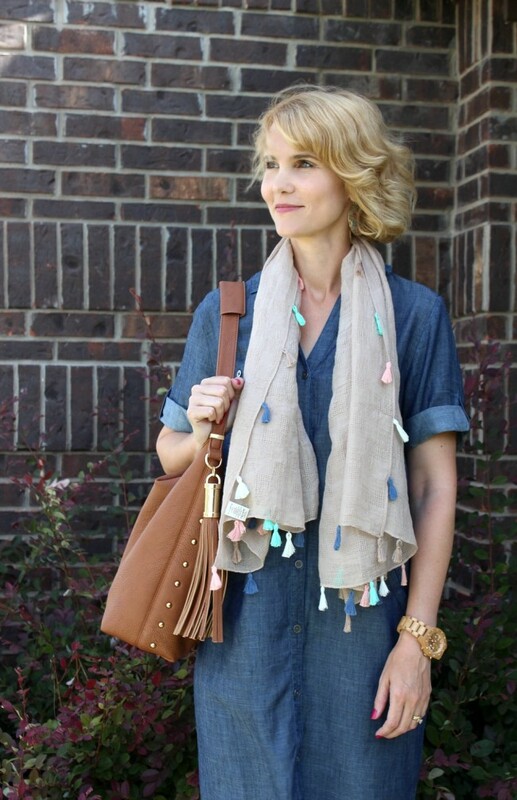 What do you get when you mix two of my favorite things: chambray + tassels? One very cute outfit idea I want to live in every single day! 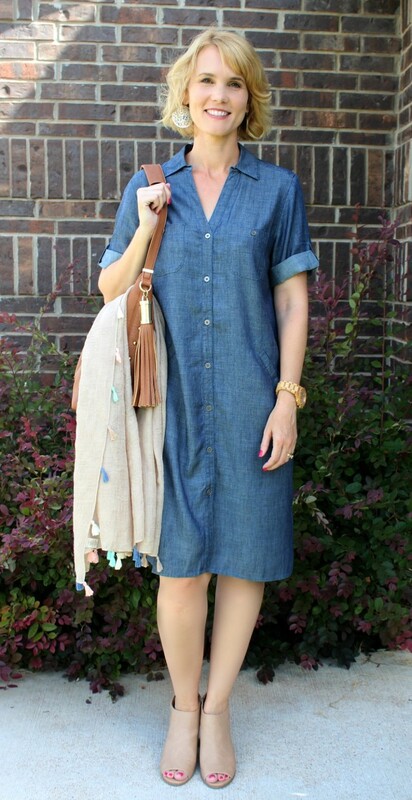 This Chambray Shirtdress outfit is one of my July favorites. I’m always on the hunt for dresses I feel like I can live in. For the summer and early fall, they need to be lightweight, comfortable and versatile. 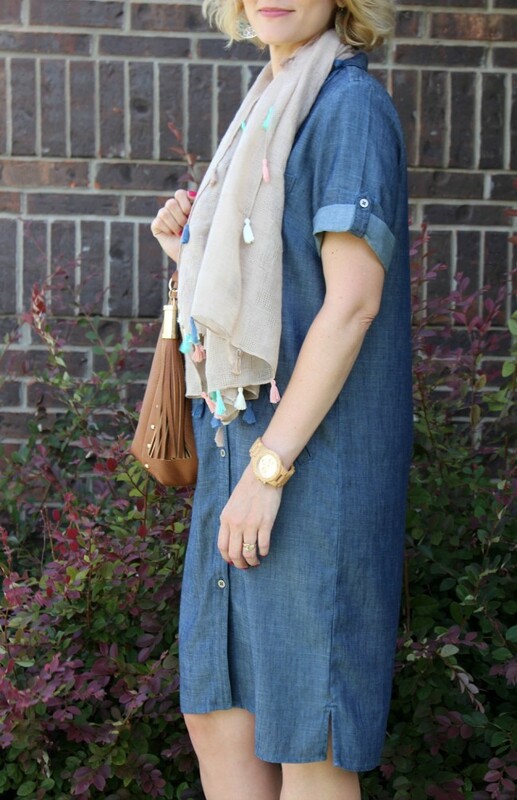 This tencel Linen Shirtdress from the J. Jill July collection is all that and more. The minute I slipped this on, it was love. 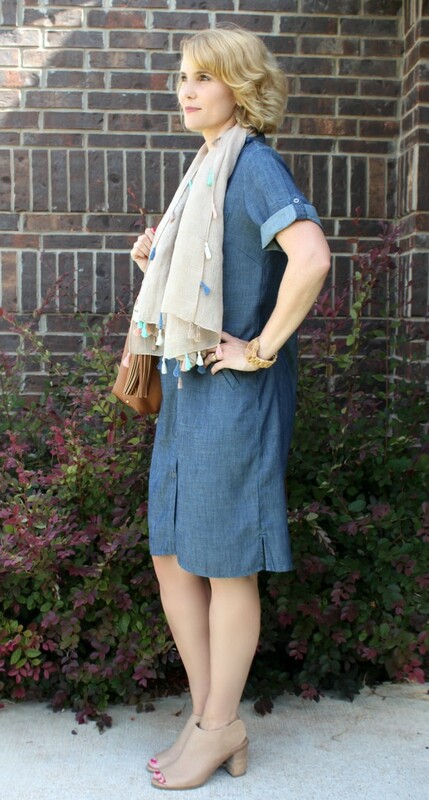 This casual chambray shirtdress is very lightweight, has elbow length sleeves that roll and tab and features side vents. It’s 70% Tencel® lyocell and 30% linen woven, can be machine washed and is so comfortable, you could just about sleep in it. I paired this dress with my new Tassel scarf from Conversation Pieces. The scarf is called Adventure Awaits, which I just love. I always travel with a scarf and/or lightweight cardigan in the summer. Planes and airports can be really chilly and having something to cover with makes traveling more comfortable. I wore this scarf last week on the plane to Colorado and again this weekend on the plane to D.C. This scarf has already seen lots of adventure! And yes, as you’ll notice – my handbag has a tassel too. Told you I was a wee bit obsessed right now! 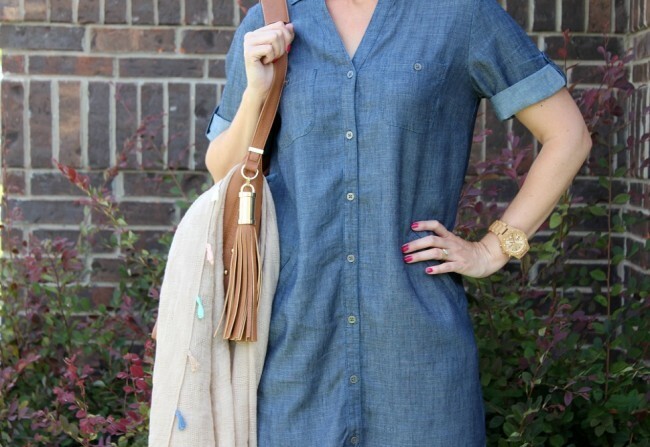 Here’s what the chambray shirtdress looks like without the scarf. Cute isn’t it? 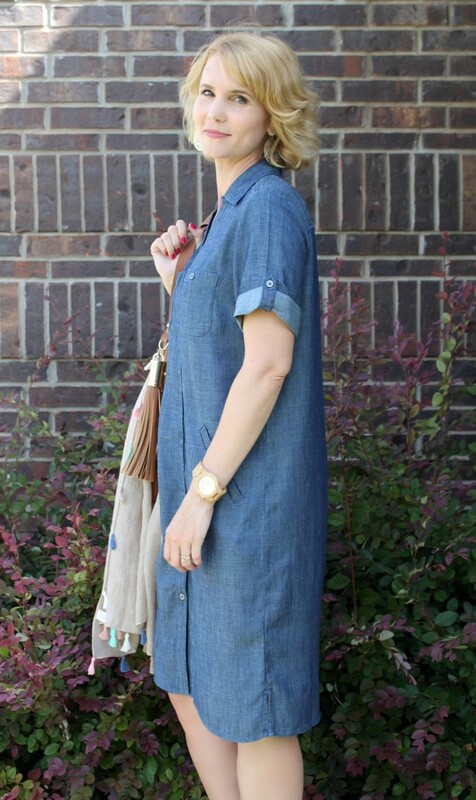 I love the length and the fact that a shirtdress is a little roomy, but without being too roomy. My go-to dress is often one that defines my waist, but I am loving the comfort of this one. 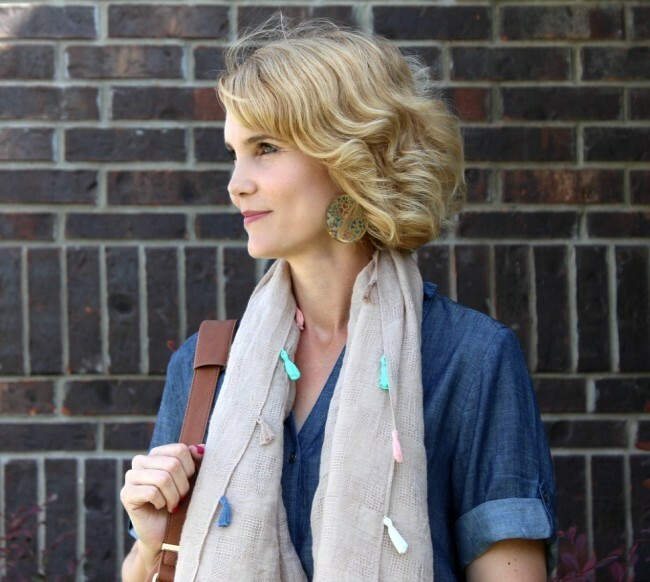 Not to mention how flattering chambray is on every skin tone. Have you ever worn a shirtdress? Let me know! Stay tuned for more great July styles from J. Jill. Also, be sure to check out my Conversation Pieces feature from yesterday. Disclosure: Mom Fabulous received samples to facilitate this post. This post contains affiliate links. Next article10 Stylish Maxi Dress Outfits + Link Up Yours! You look absolutely adorable. I am looking forward to browsing your blog. I found you through Conversation Pieces. I found Conversation Pieces through a pin a few years ago. I have purchased several items at Conversation Pieces. I have been very pleased with the quality, prices, adorable packaging and prompt shipping. Hi Kimberley! Thank you for your kind comments! I am absolutely loving Conversation Pieces and the items I have received.